But seriously, pointing out their awesomeness in front of others will give them all of the warm fuzzy feelings and let them know that you are seeing their hard work. Know what else will make em feel great? When OTHERS compliment them on a job well done too! Woah. That’s where the shout out wall comes in handy. Create a space where your team can jot a quick ‘good job’ note to each other. You have a couple of options here, you can put it in a place that’s accessible only to staff, or you can make it accessible to campers as well. It’s up to you. It’s also your call whether campers can participate in the shout outs (both in terms of giving and receiving compliments). I say why not, just as long as it doesn’t get out of hand and over the top silly – but I’m all for any activity that promotes kindness and recognition. 2. Make sure there are writing utensils readily available, no one is going to use it if they have to track down a pen to write something. 3. Wait until day 2 or 3 to start it for the week, those are the days when people are starting to hit their groove/ feel some stress. A kind word means more on the days when you really need it. 4. Be creative. 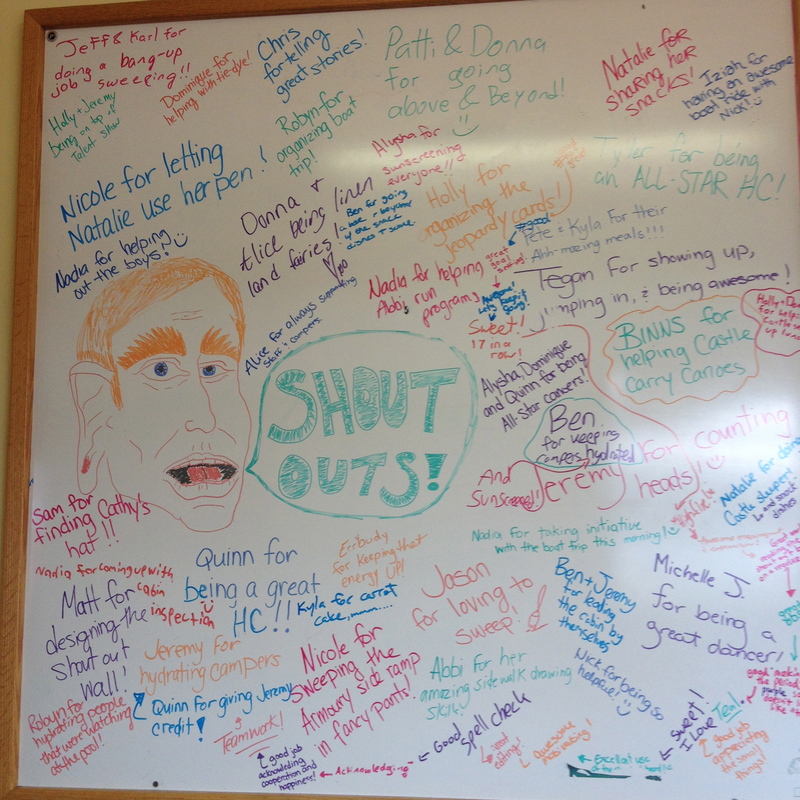 Do a face saying “shout out wall” or a hand saying “high-five” or a star saying “superstar moments”, you get the point. 5. Enlist your staff, if you have someone on staff who’s creative and good to draw ask them to help with the design of the board. 6. Make your expectations clear. The first week of summer I will write a little blurb on the wall explaining how it works. It could be as simple as “write something great that someone did this week” and I’ll usually follow-up at meeting explaining that only kind things should be written, no sarcasm, and no backwards compliments, etc. 7. Be an example. Write stuff. They don’t all have to be serious notes. I have thanked a volunteer just for showing up. 8. Remind people about it, your staff are busy doing other stuff… like their job… but encourage them to take a few seconds to appreciate their teammates. It will go a long way to maintaining good energy throughout the week/ summer. 9. Make sure that they’re not spending too much time on it. There’s no reason to take 10 minutes (or even 5.. or 2) to write something on the board. Don’t let them use it as a way to get out of work. We all know those staff. sigh. Unfortunately, there are always some staff who are less ‘popular’ than others, and will get fewer notes on the board. Walking by everyday and not seeing your name at all can actually have the opposite effect of what we’re going for here, it can be demoralizing, and sad. So enlist your leadership staff/ senior staff/ or even just returning staff (cause I’m assuming if they’re returning they’re all great and trustworthy) and ask them to choose a counsellor to keep an eye on, to ‘catch them doing good’. Then write about it. This trick will have three benefits, 1. the ‘unpopular’ staff gets nice things written about them and they feel happy. yay. 2. the staff member who is ‘watching out’ for that staff will start to see them in a better light, because when you’re looking for, and focusing on, the positives it starts to shift your perspective. 3. other staff will see great things written about that person and start to think of them more positively too. Don’t let this take the place of actual conversations. It can be a follow-up to, or a precursor to, a real conversation. Like my example in tip #10, say the thing, AND write the note. Encourage your counsellors to use something like this with their campers in their cabins. 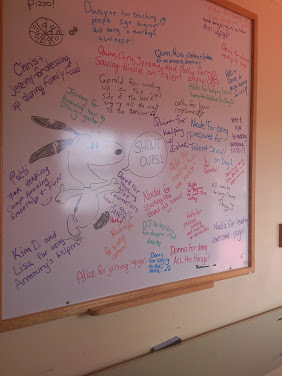 You can never have too much kindness, so regardless of whether campers are included in the main board or not, suggest each cabin do one of their own. 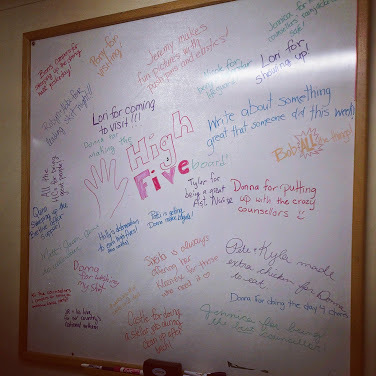 What sorts of things do you do at your camp to promote gratitude, kindness and positive team dynamics?